Hi Chris, I'd like to try to make a Chronos2 board by home etching so I designed a schematics in Fritzing, here attached. I have a couple of doubts. First of all I'm not sure about the optocoupler pins connections. Furthermore, my DSLR is a Nikon, the focus signal must be closed before shot signal. You make use of only one opto for the camera shutter, how do I connect the focus and shutter signal of my cam? Another question is about the stepper driver. If I correctly understood, the 3 MS pins are connected toghether so the stepper is driven either at full step or 1/16, right? 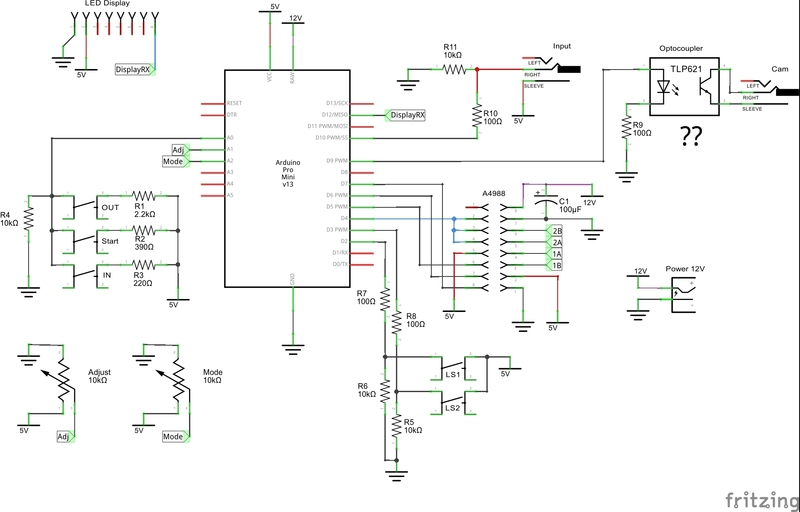 In case I use a DRV8825 instead of the A4988 the stepper will work at 1/32 instead of 1/16, is this a correct alternative? Last but no least ... where I have to place and connect the RES button? Sorry my last reply was killed becuase of browser issues ugh. Reset, in order to reset feed a +5v signal to it. So use a button to feed it +5, and use a pullup resistor 10k on the leg going to ground, thats how i wire it up. CHronos only uses one optoisolator because it bridges the TIP and RING together, so shutter and Focus are bridged together permanently. It still works to wake the camera and such, if you need the camera to focus just put it in focus priority instead of release priority. So far it has worked just fine that way. For the driver, i used those in the past and had issues. i recommend buying a a4988 driver. Maybe my DRV8825 were just buggy, but i couldnt get them to work nearly as well as the a4988. if using a motor over 1 amp just throw a headsink on the chip. I have run motors as high as 2.8 without issues. So the RES button works like the Reset button on the Arduino boards, right? If the objective is to reset the board, I seen some Arduino tutorials about adding an external reset button that show a connection from Arduino RST pin to GND by means of a momentary button. Is this a possible and simpler alternative?